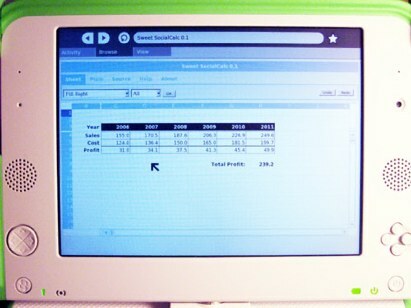 I showed my testbed application to SJ Klein of the OLPC project and he reacted favorably and encouraged me to continue. The executives at Socialtext encouraged me to follow through and are supporting what I'm doing. Dan is looking for feedback and volunteers to help advance the project. Dan Bricklin hit his big milestone, with the release of wikiCalc 1.0. Now that wikiCalc has made the step to version 1.0 status, it is time to look to the future. There are many important features to be added and many people to bring into the project so that it can flourish. I intend to continue devoting a lot of time to this product. Here's what will happen next: As I wrote back last June, Socialtext is going to integrate wikiCalc functionality into their wiki system and provide hosting and support to those that want it. They are also funding an open source project around the wikiCalc code so that I can move the product forward as part of a community. This wikiCalc 1.0 code will form the base release to start what Socialtext is calling the SocialCalc project. While the Software Garden release of wikiCalc is covered under the GPL 2.0 license, Software Garden is the author of the entire wikiCalc product and owner of the copyright. There have been no "contributions". This will change with the SocialCalc codebase. That code will be developed much more in the open and will accept contributions from others (subject to my approval for now) who will hold the copyright to their contributions. My development work on new features will be going into SocialCalc, and Socialtext will be providing a lot of developer time, too, so that is where the future action will be. SocialCalc will be released under a Socialtext Public License that, being based on the Mozilla Public License 1.1, may be more appropriate for some companies who have issues with the GPL. (For users that want code covered under the GPL, this wikiCalc version 1.0 will always be available under that license.) There will be more news about SocialCalc at a later time. For me, this is a major milestone. It's been a long time since I've brought a product all the way from conception to 1.0 release. I love programming and I love developing products and the last year and a half has been a treat. I look forward to sharing the next phase with others. A comment tipped me to the fact that Openformula.org has been (mis)appropriated by a cybersquatter. This website used to be the home of the spreadsheet standard of the Open Document Format (ODF) to which SocialCalc is compliant. BTW, we are still looking for the right person to work with us as a SocialCalc Developer. When we launched SocialPoint on Monday, I had a chance to sit down with Sam Ramji of Microsoft. A video of the conversation and Sam's thoughts are on Port 25. Even more interesting to me given my role at Microsoft is that Socialtext has built a Sharepoint integration ("Socialpoint"). This gives Sharepoint users access to a best-of-breed wiki and blogging engine while retaining presence, Office integration, and a unified portal infrastructure. My inner geek got going when Ross described the new protocol handler they’ve built - "socialpoint:foo/bar" - for navigating within Sharepoint across wikis. I think this is a good example of how Microsoft platform software should be combined with open source applications. We continue to invest in scaling the infrastructure, and open it up to developers for innovative applications that can change as often as customers require. ...wikiCalc has the potential to be an important product for the Open Source community as well as for IT in general. 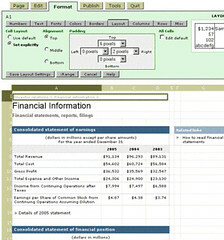 It is a complete server-based spreadsheet that runs on your own server, not only on a service provided by others. It keeps an audit trail that may be helpful to corporations that are concerned about such things (Sarbanes-Oxley?). It works like a wiki as part of a web of potentially editable pages in a collaborative environment. It is written in a popular scripting language (Perl) that makes it well suited for experimentation. It would be great to have the 1.0 release come out after a reasonable amount of final testing. What's new in wikiCalc 0.96 includes support for the 109+ computational functions listed on Openformula.org, part of Open Document Format (ODF). The product is fully internationalized, and easy to localize using a single human-readable file. In a visual sense, I wanted the product to be able to produce real web pages that were at a professional enough level that corporations would feel comfortable using the product for internal use and perhaps even external use. That was a real challenge which I believe that I've met. 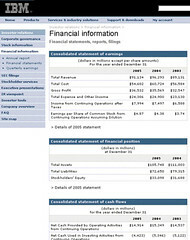 As an example, Dan replicated the IBM Financial Statements you would find in the investor relations section of their website. Only one key difference, the ability to let some people have the ability to edit this page. Socialtext is working to integrate wikiCalc as SocialCalc into our Appliance, Hosted and Open Source distributions at the end of the year. Dan Bricklin prepared a screencast (7Mb, .swf) as an introduction to using wikiCalc. In it, you will see him paste from Excel and mashup stock quote and charting feeds. The Associated Press posted a in-depth profile of Dan that's a great read. Also read his blog posts working with Socialtext and the Beta release. UPDATE: Podcast with Eric Lundquist from eWeek and Dan Bricklin.